IBM Tivoli Monitoring Version 6.2 is a powerful monitoring product from IBM, that is easily customizable and provides real-time and historical data that enables you to quickly diagnose and solve issues through the IBM Tivoli Enterprise Portal component. This common, flexible, and easy-to-use browser interface helps users to quickly isolate and resolve potential performance problems. 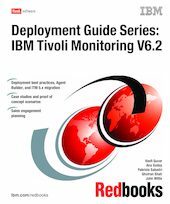 This IBM Redbooks publication presents a deployment guide for IBM Tivoli Monitoring V6.2. We cover planning, installing, and configuration of IBM Tivoli Monitoring V6.2 for small, medium, and large environments. In addition, we provide some case studies, such as IBM Tivoli Monitoring V5.x migration, event management integration, and Agent Builder. Agent Builder is a very powerful tool that you can use to develop your own monitoring agents. In order to show you how this tool can be used in a real life scenario, we have created a 30 minute video that you can launch from the ITSO Web site. We have also added an appendix that discusses IBM Tivoli Monitoring sales engagement planning for Business Partners and Solution Developers. The target audience for this documentation is IT Specialists and Business Partners who will be working on IBM Tivoli Monitoring V6.2 implementations and proof of concepts.